The initial observations on the potential of umbilical cord blood came from the laboratories of Broxmeyer, Knudtzon, Lansford, Metcalf and others, demonstrating that the cord blood contained a high percentage of granulocyte-macrophage progenitor cells [1-3]. These initial experiments led to work in a murine model, showing that neonatal mice contain sufficient progenitor cells that repopulate the lethally irradiated mice. 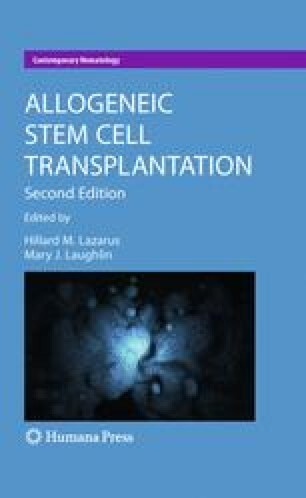 Sufficient progenitor cells were also found in the human cord blood, and was used to promote engraftment, leading to the first successful cord blood transplant in 1988 [2, 4]. Further investigation, subsequent to the initial clinical studies, revealed the unique properties of umbilical cord blood grafts. CD34+ cord blood cells increase faster than adult bone marrow cells in culture, allowing a 10-fold lower CD34+ cell dose to be used in cord blood transplants [3, 5].